Provided under NRS 108.2457(5)(b), this waiver releases all claimant rights through a specific date unconditionally, even if the checks were returned or had stopped-payment orders. 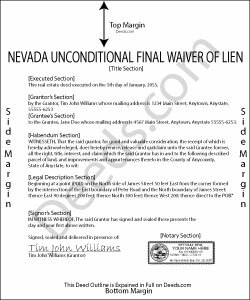 Because this is an unconditional waiver, only use it when a progress payment has actually been made and received. Contact an attorney to with questions about waivers or any other issues relating to Nevada mechanic's liens.